Pawan Kalyans -Attarintiki Daredi- RECORD COLLECTION CENTERS UPDATE | GSV Films :: Film news, video songs, movies news telugu, tamil hot actress. "Attarintiki Daredi" has earned over ₹22 crore in its opening weekend at the Andhra Pradesh box office, according to film critic and trade analyst Taran Adarsh. The Pawan starrer created an all-time record, raking in around ₹10.72 crore on its first day. The film's collections dropped on the second and third day, minting ₹5.74 crore and ₹5.72 crore, respectively. The breakup of the third day collections: ₹2.20 crore in Nizam, ₹1.05 crore in Ceded, ₹55 lakh in Vizag, ₹49 lakh in Guntur, ₹46 lakh in Krishna, ₹39 lakh in East, ₹36 lakh in West and ₹22 lakh in Nellore. Total collections of day 3 is ₹5.72 crore and opening weekend collections stand at ₹22.18 crore. "Attarintiki Daredi" (AD) will soon surpass the collections of some of the biggest Telugu hits of 2013. Venkatesh-Mahesh Babu's "Seethamma Vakitlo Sirimalle Chettu" (SVSC) earned approximately ₹25 crore in the first week of its release. But "Attarintiki Daredi", which has grossed around ₹22 crore in its first weekend, is expected to earn more than "SVSC" in less than a week. Jr NTR's "Baadshah" minted around ₹24 crore during the first week in the state. "AD" will easily surpass the collections in less than five days. "AD" has reportedly performed better than other big releases of 2013, including Ram Charan's "Naayak" and Prabhas's "Mirchi." "AD" has recorded the biggest ever opening for a Telugu film in Tamil Nadu. According to senior film journalist Sreedhar Pillai, the family entertainer earned ₹1.08 crore from 41 screens in its first weekend. The film has broken all box office records and emerged as the highest grossing opener for a Telugu film. The Pawan Kalyan film is doing fantastic business, despite new releases. According to trade analysts, "AD" fetched around ₹2.5 crore in the state, which is also an all-time record. 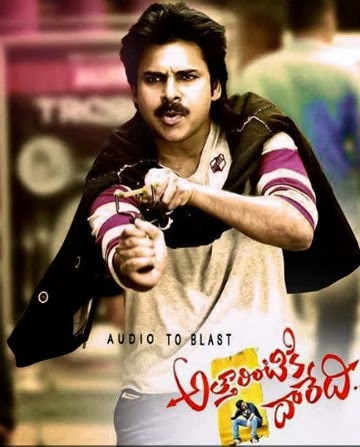 "Attarintiki Daredi" seems to be the buzz word in US markets. It has embarked on an earth-shattering response in the country, where Telugu films have a huge fan following. The Pawan starrer raked in over ₹5 crore in two days of its release including Thursday previews. The film has earned around ₹10 crore in its first weekend. In its opening weekend, "#AttarintikiDaredi collects $ 1,522,734 [₹ 9.53 cr]. Note: Reported screens only. Incl non-Rentrack screens total: $ 1,742,734 [₹ 10.91 cr]," Taran tweeted. "AD" has been placed in the list of "top 15 grossers this weekend" at the North American box office. Prior to the film's release, only two Hindi films - "Chennai Express" and "Yeh Jawaani Hai Deewani", made it to the list. "AD" has earned a whopping amount in its debut weekend at the US box office, which most Hindi films have not collected in its entire lifetime from overseas markets, Taran said. With no big releases, "AD" is expected to continue its dream run and reach the ₹50 crore mark soon.